Why Follow Bunion Surgery Aftercare Instructions? Bunion surgery is the only way to correct this painful foot deformity . Unfortunately, it’s possible for the surgery to fail, and for the patient to require reconstructive foot surgery. Foot surgeons in Sugar Land strongly recommend that patients carefully follow their aftercare instructions, as doing so improves the chances of a successful recovery and reduces the risk that reconstructive surgery will be needed later. Familiarize yourself with your aftercare instructions before you have bunion surgery. Preparing for your recovery can make it easier for you to follow these instructions. You’ll need to keep weight off your foot for a certain period of time, and keep that foot elevated as much as possible. At first, you’ll wear a cast or walking boot, and you’ll use crutches. After the cast is removed, you’ll need to work with a physical therapist to regain your strength and range of motion. If you typically wear high heels, you’ll have to avoid this for at least six months. Faithfully following your aftercare instructions will yield a much more favorable outcome. Surgery is a common strategy podiatrists use to correct health problems with the feet. Because recovery time from foot surgery can be lengthy, most foot specialists recommend it after conservative treatments have failed. Despite the recovery time, surgery is sometimes the best way to alleviate foot pain and prevent further damage to the feet from happening. Here is a look at some of the types of foot surgery your podiatrist in Sugar Land may discuss with you. 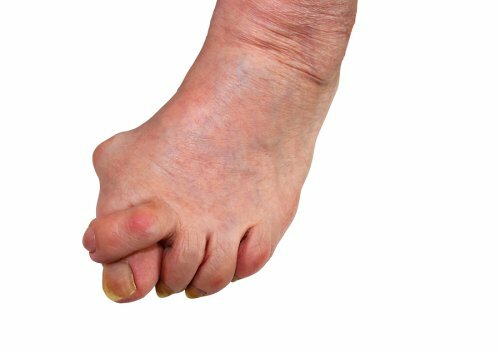 Bunions are growths that occur on the joint where the big toe meets the foot. They can be extremely painful and interfere with your mobility. If you have a bunion that is diagnosed in its early stages, it may respond to anti-inflammatory medications and wearing certain types of shoes. In advanced stages, however, surgery may be necessary. Depending on the size of the bunion, your foot specialist may recommend a bunionectomy, during which a small portion of the bone is removed, or a more invasive joint realignment. Joint realignments are reserved for the most severe bunions. Neuromas are enlarged bundles of nerve tissue, usually between the third and fourth toe. They cause pain, tingling, and numbness at the base of the toes and on the balls of the feet. Neuromas can be treated without surgery in most cases when they are diagnosed early, but once they become advanced, surgery is necessary. During surgery, the foot specialist will remove the inflamed nerve to ease the symptoms. When part of the foot or ankle becomes damaged or deformed, reconstructive surgery may be necessary. These kinds of foot issues can occur as the result of injury, congenital condition, or diseases such as osteoarthritis and rheumatoid arthritis. There are a number of different reconstructive procedures, and the recovery times vary widely as well. Your podiatrist will recommend a procedure based on the nature and severity of your condition. Should You Consider Bunion Surgery? 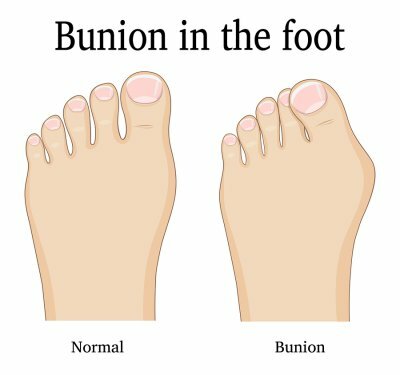 Bunions, which affect women more often than men, might not be dangerous to your overall health, but they are certainly painful. They occur as the result of an enlargement in the joint at the base of the big toe. Because that joint bears a large portion of your weight when you step, a bunion can cause pain with every step. If you’re dealing with a bunion in Sugar Land , should you consider surgery? Watch this video for some insights about bunion surgery. If your symptoms aren’t relieved by conservative treatments, your foot specialist may recommend surgery. If you develop a bunion, see your podiatrist as soon as possible. Conservative treatments are most effective when they are started early. After being diagnosed with diabetes, a podiatrist in Sugar Land will become an important member of your care team. Foot doctors are experts in treating patients with diabetes-related foot problems, including peripheral neuropathy. Peripheral neuropathy is nerve damage that affects the limbs, hands, or feet. Most often, the symptoms are felt in the toes, feet, and lower legs. Diabetes patients are at a higher risk of peripheral neuropathy because uncontrolled blood glucose levels can damage the sensitive nerves. As a result of the nerve damage, patients may suffer from foot pain, numbness, weakness, and tingling. The pain of peripheral neuropathy is often described as a pins and needles sensation, or a sharp, burning pain. When working with patients with diabetes, the podiatrist will routinely check nerve function in the feet, look for wounds, and provide foot care counseling. With the proper podiatric care, patients with diabetes can greatly reduce their risk of neuropathy-related complications, including infected foot wounds, systemic infections, and amputation. The appearance of a lump under the skin can be alarming, but fortunately, lumps aren’t always cancerous. Sometimes, the development of lumps along the joints of the feet and ankles indicates ganglion cysts . These benign lumps are round or oval, filled with viscous fluid, and occasionally painful. If you’ve been diagnosed with one or more ganglion cysts, your podiatrist in Sugar Land will explain your treatment options. There are both nonsurgical and surgical options for resolving your foot pain. It might not always be necessary to treat a ganglion cyst, especially if it doesn’t cause foot pain. Your podiatrist might recommend closely monitoring the cyst for a while. If the cyst does later press on a nearby nerve, you’ll feel tingling, numbness, muscle weakness, and pain. At this point, it’s time to consider treating it. Changing your footwear may help relieve your symptoms. Your podiatrist might recommend switching to a larger or wider shoe to prevent friction from irritating the cyst. You might also use some extra padding inside the shoe to protect the area. Let your foot doctor know if the ganglion cyst is causing troublesome pain or is interfering with your day-to-day activities. It might be time to aspirate the cyst, which refers to the nonsurgical removal of the viscous fluid inside the lump. First, the doctor will thoroughly numb the skin in the area to prevent you from feeling any pain. Then, a sterile needle is used to puncture the cyst and draw out the fluid. You may be asked to rest the area for a day or two. Apply an ice pack wrapped in a soft towel to the area for about 20 minutes. You can use an ice pack about every hour or two to decrease the swelling. It is possible for a ganglion cyst to come back after it’s been aspirated. If the cyst does come back after aspiration, it may be time to consider having foot surgery. Ganglion cyst surgery is a straightforward procedure that only requires a small incision to excise the cyst. Most patients resume their normal activities within three to six weeks. Has your podiatrist in Sugar Land suggested reconstructive surgery for your foot pain? If so, then you probably have questions about how your procedure will be performed and if any surgical hardware will be needed. Read on to learn about implant hardware that may be used by your foot surgeon. If your podiatrist says that implants will be needed for your procedure, then he is referring to a type of surgical hardware that will be placed in or on your body. When it comes to ankles and foot surgery, implants are usually used to strengthen tendons and ligaments, attach tendons and ligaments to bone, hold bones together, or replace bone. Surgical hardware in the form of implants is categorized as either biologic or non-biologic. Biologic options are those that are typically used to strengthened or replace damaged tissue and that are similar to human tissue. Biologic implants can also seem to disappear eventually. Implants that are non-biologic are those made from materials that are designed not to change over time. Examples of this type of hardware include plates and screws made from metal, plastic, and composite materials. Hardware that is plastic or biologic does not show up on x-ray. The material chosen by your doctor will depend on the application that it’s needed for. Patients commonly wonder if they will need to have their surgical hardware removed later. Generally, removal of an implant should not be necessary. However, if the hardware is limiting your motion or causing you pain after the surgical site has healed, then your surgeon may recommend that you have the hardware taken out in a second procedure. Also, patients can benefit from knowing that their surgical hardware for foot surgery should not set off airport alarms at their current sensitivities. Finally, many people wonder about the use of surgical hardware and infections. Today, no evidence shows that implants used in orthopedic surgery increase a patient’s risk of infection. Plantar fasciitis is characterized by heel pain caused by inflammation of the plantar fascia, which is a fibrous band of tissue that runs from the heel to the ball of the foot. Has your foot doctor in Sugar Land diagnosed you with plantar fasciitis? If so, then he may recommend the use of injections as part of your treatment. Read on to learn about this treatment option. Pain in the bottom of the heel is something that many people experience at least once in their life. Some of the most common causes of plantar fasciitis and the pain that it causes include wearing improper shoes, overusing the foot, being overweight, and having flat feet. The plantar fascia tissue is responsible for supporting the shape of the foot, is used more when you are standing, and works as a shock absorber. Scarring and irritation of this tissue are among the most common causes of heel pain. The standard approach to plantar fasciitis treatment is reducing the inflammation that is the cause of the patient’s foot pain. Early treatment usually starts with foot stretches and wearing a foot splint overnight, and anti-inflammatory or pain medications may be prescribed. If these methods fail to provide you with relief, then your podiatrist may advise injections. If you are considering injections for plantar fasciitis because conservative treatment options have failed to relieve your discomfort, alert your doctor if you have any medication allergies or a skin problem that affects your foot before proceeding. During the procedure, your podiatrist will inject the medication at the location in your foot that is most painful. The injection may consist of numbing medication, steroids, or both. The injection site will then be covered, and your doctor will encourage you to restart your plantar fasciitis stretches as soon as you feel comfortable enough to do so. Any numbing medication in the injection should work for several hours, and the steroid component should provide you with pain relief for at least a few weeks. Are you in need of bunion surgery in Sugar Land ? If so, then read on to learn about the reasons why this option might not be effective for every patient. Bunionectomies do not work for everyone. When conservative treatments fail to resolve a patient’s bunion, then foot specialists frequently recommend a bunionectomy. In this type of surgery, only the bony prominence is removed. This simple, surgical bunion treatment can work well for some patients, but may not be effective for individuals who have severe bunions. Bunion surgery isn’t always a permanent solution. For some patients, surgery is not effective long-term because of a recurrence of the bunion. Although your foot surgeon may be able to effectively treat your current bunion and the symptoms that it causes through surgery, this does not guarantee that the bunion will not reform. If you choose to continue wearing high heels or narrow-toed shoes after your treatment, then the recurrence of the bunion becomes more likely. Bunion surgery doesn’t meet everyone’s expectations. Some patients decide to undergo bunion surgery because they are dissatisfied with the appearance of their feet. While bunion surgery is likely to improve the aesthetics of your foot, it may not completely restore its original appearance. Also, some patients are unhappy with the reduced flexibility in their big toe joint that can occur. Before undergoing bunion surgery, it’s essential to discuss your expectations with your doctor and to gain a good understanding of your probable outcomes. Bunion surgery is not always successful. As with any other surgery, it’s possible for bunion surgery to fail, and there are a number of complications associated with bunion surgery of which every patient should be aware. Prolonged swelling, infection, and deep vein thrombosis can result from this treatment. Some of the other possible complications include over- or under-correction, loss of correction, joint stiffness, and nerve entrapment. Speak with your doctor to gain a full understanding of the possible complications associated with bunion surgery. Is It Time to Kick the Stiletto Addiction? Your shoes play a big part in your foot health, and one of the top offenders when it comes to foot pain and injuries is stilettos. Although you may love the way your heels look with your favorite dress, sky-high stilettos take you one big step closer to a range of foot problems. If you’re dealing with foot pain in Sugar Land , talk to your foot specialist to see if your shoe choice could be to blame. When you wear stilettos, you force your feet into an abnormal position, which is further exacerbated by the unnatural gait that is common with high heels. This can cause mechanical foot and ankle problems, bunions, and chronic foot pain. If giving up your favorite shoes entirely isn’t appealing, talk to your foot doctor about the best options for healthier high heels. Forgo stilettos in favorite of shorter heels, and look for heels that wider rather than spiked. Choose a wide toe box, and consider adding gel inserts to make your shoes more comfortable. Limit the amount of time you’re walking in heels to prevent long-term damage.